Rent villas and apartments in Die, France with private pools. This beautiful holiday home with private swimming pool opens its doors 14km from Die and will be a relaxing and peaceful for an unforgettable stay in the Drôme. Nestled on a hillside. Close to the village of Ste Eulalie in Royans. 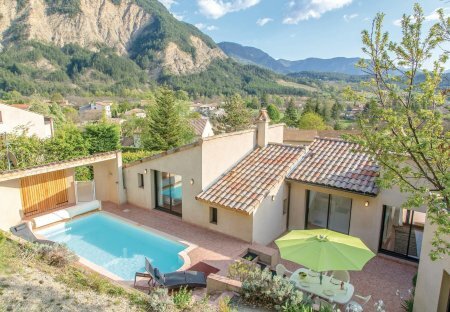 This elegant five bedroom villa is situated in the small town of Loriol-sur-Drôme, which is home to beautiful timbered houses and pretty fountains. This beautiful holiday property is nestled in lush greenery in the heart of the valley of Andran in the Drôme Provençale, between the villages of Manas and Puy St Martin. Located 10km from Die, in the charming village of Saint Roman, this pretty holiday home awaits you for a relaxing stay in the Drôme. Contemporary house of charm made of quality materials. Part of a house in a small hamlet. This holiday in the Drôme promises its guests plenty of rest and relaxation. Located 32 km from Die. This 2 bedroom house with swimming pool is located in Romeyer and sleeps 6 people. It has parking nearby, a gym and a spa. This huge semi-detached house is on the heights of a village in the pretty department of the “Drôme des Collines”, in the Vercors Regional Park. This detached holiday home is on the edge of the village of Luc-en-Diois. The village is located in the heart of Drôme, around 20 km to the south of the city, which has a rich history. This 2 bedroom house with swimming pool is located in Romeyer and sleeps 4 people. It has parking nearby, a gym and a spa. This 3 bedroom apartment with swimming pool is located in Romeyer and sleeps 8 people. It has parking nearby, a gym and a spa. This pretty little contemporary house is a charming holiday rental 15km away from Die. Perfect for relaxation, it offers a huge wooden terrace and a beautiful view of the mountains. This 2 bedroom apartment with swimming pool is located in Romeyer and sleeps 4 people. It has parking nearby, a gym and a spa. This one bedroom holiday home in Crest is a fantastic base for a holiday in the beautiful region of Drome. The ground floor apartment boasts a sunny terrace, with barbecue facilities. This charming welle renovated stone house has two well oriented terraces, garden furniture and BBQ in a park.